May 10 – I will be performing in the California Camber Orchestra concert at the Old Town Temecula Theater. Humankind’s quest for meaning has inspired so much in the arts. We’ll explore how music transcends the messages of all our faiths with prize-winning violin/piano duo Iryna Krechkovsky and Kevin Kwan Loucks. 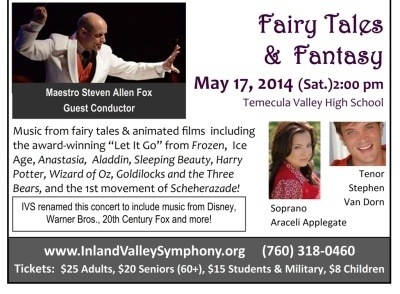 May 17 – I will be performing in the Inland Valley Symphony Fairy Tales and Fantasy Concert. This is the last concert in this season, and usually sells out. Enjoy music from fairy tales & animated films: Ice Age, Anastasia, Aladdin, Sleeping Beauty, Harry Potter and the Wizard of Oz, including the award-winning “Let It Go” from Frozen. The 1st movement of Scheherazade and the narrated story about Goldilocks and the Three Bears will highlight the concert. 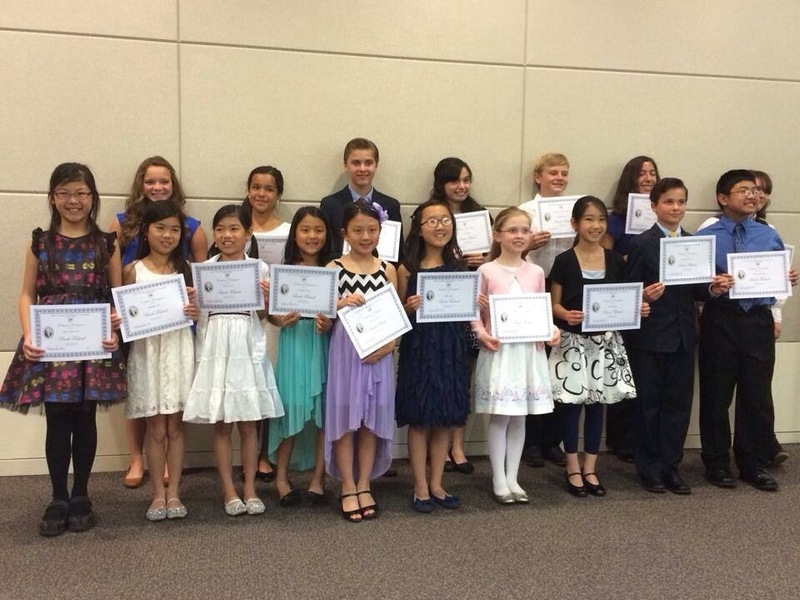 May 17 – The following students will participate in the Temecula Young Artist Piano Competition: Charys Hong, Rachel Hong, Shania Jin, Katherine Shepherd, Sarah French, Emma Erickson, Hudson Erickson, Hunter Erickson, Claire Howard, Catherine Howard, Cheryl Tan, Jeffrey Kim. Good luck to them! I will NOT be teaching on May 17. There are five Saturdays in May, so all Saturday students will still receive four lessons. 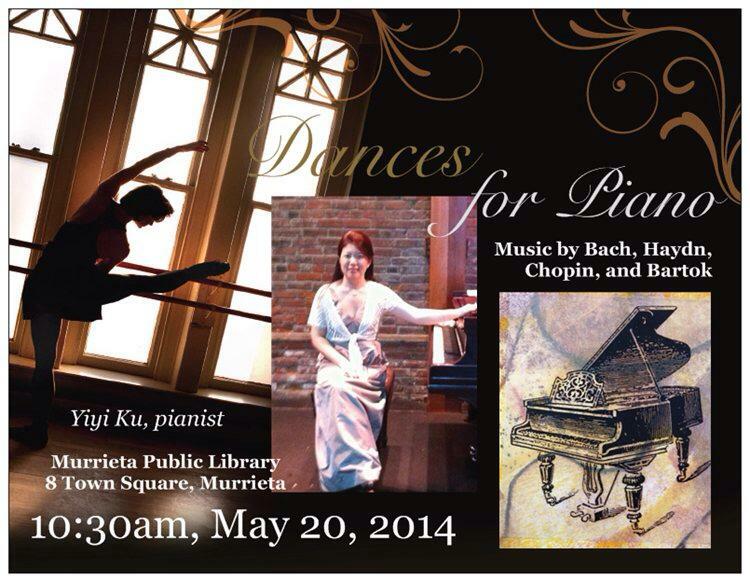 May 20 – I will be performing a solo recital for the Friends of Murrieta Library at 10:30am. The recital is free and open to the public. 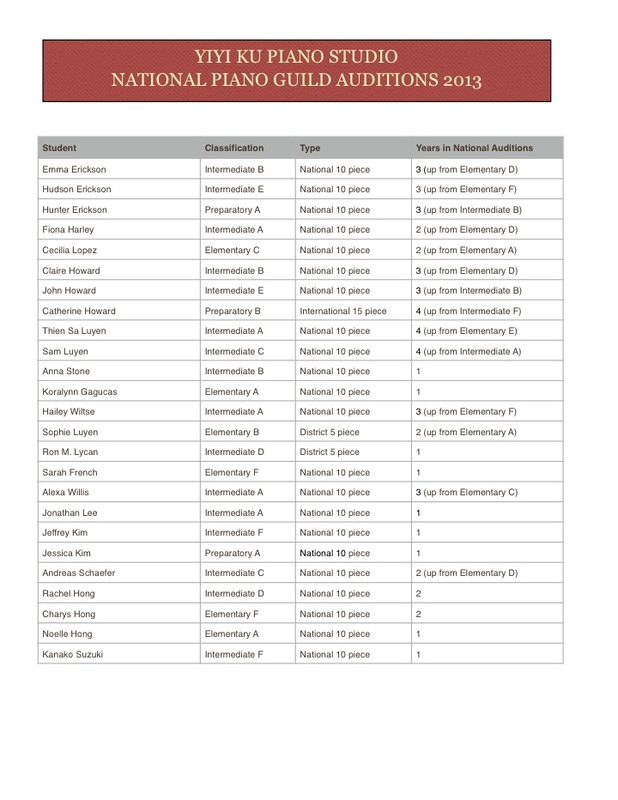 May 24 – The following students will sit the Royal Conservatory Music Development Program Piano Performance exam. Good luck to them! We will have two recitals, starting from 1pm and 2pm, and students only need to be present in the recital they are playing in. 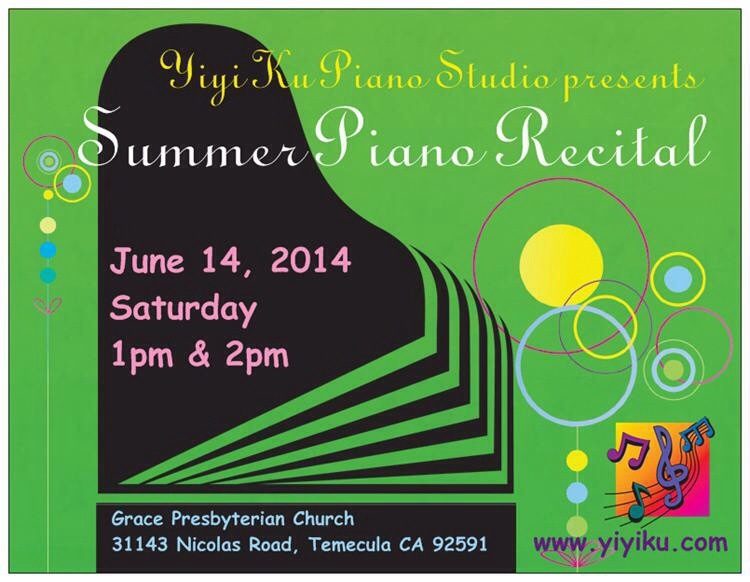 We will take a group picture in between the two recital sessions. I look forward to seeing everyone perform! Cheryl is 9 years old and goes to Tovashal Elementary School’s 4th grade, where she has achieved straight As to date. 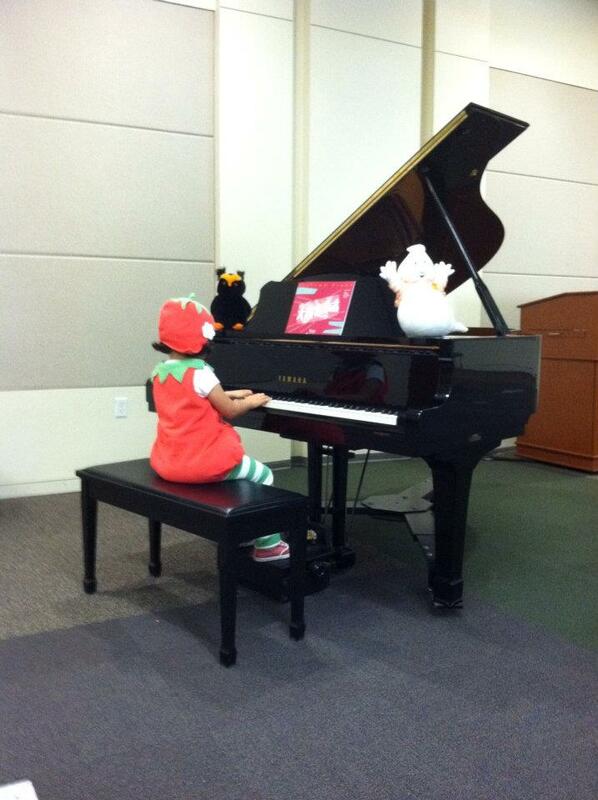 She was born here in Murrieta, though her parents are originally from Singapore. She has 3 sisters, one of whom is her identical twin, Chanelle, born a minute earlier. Musically, she is by far the most passionate, and never fails to do her hourly morning piano practice before heading off to school. This is her 3rd year with Yiyi and it is her long-term goal to complete level 10 of the MTAC Certificate of Merit by the time she completes high school. Recently, Cheryl was fortunate enough to have been picked one of the winners of the 2014 Junior Bach Festival, her first ever competition. 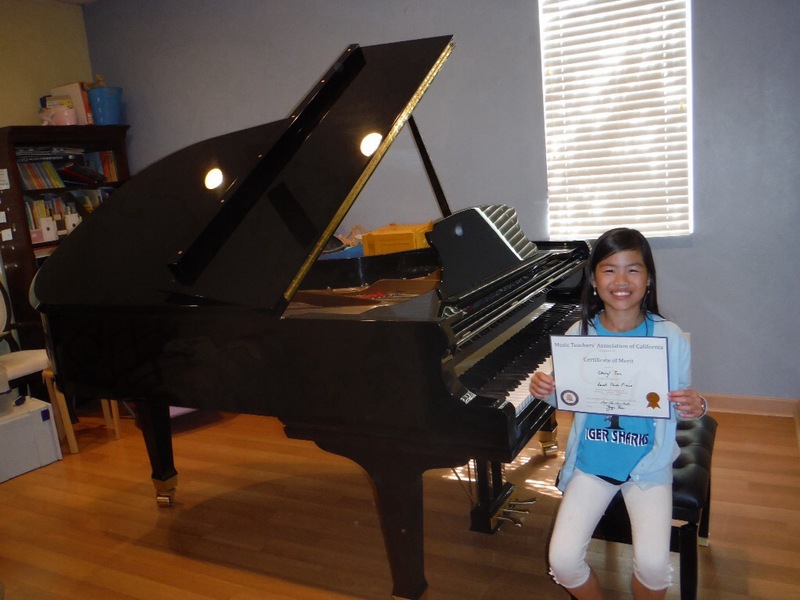 As serious and dedicated as she is about the piano, Cheryl has been also playing the violin as her secondary instrument as of early this year, and hopes to eventually be part of the Inland Valley Youth Orchestra. When not losing herself in music, Cheryl enjoys obsessing over her Kindle books, playing Wii video games and simply enjoying her childhood and siblings. Teacher comment: Cheryl has been making exceptional progress this year, both technically and musically. She always comes to her lessons fully prepared, and usually has more to show me than what I assign her. 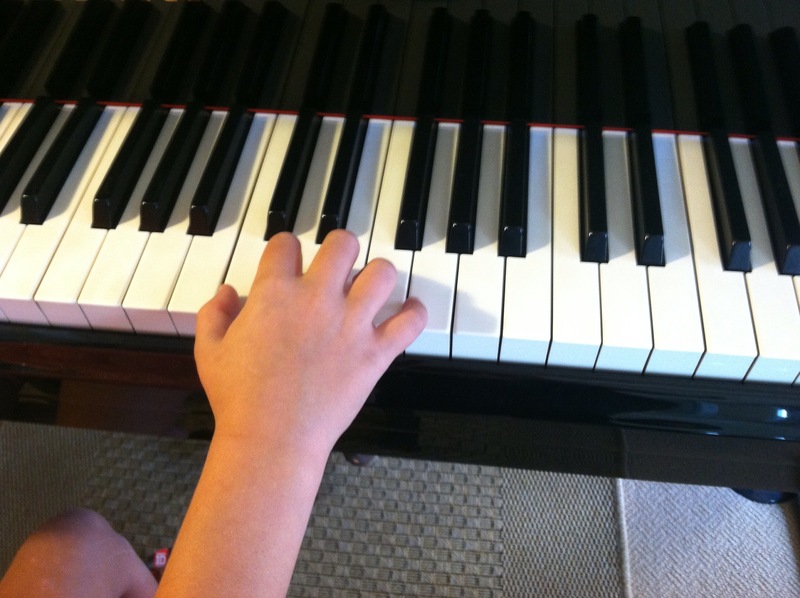 I am impressed with how quickly she can learn a piece on her own. For the Bach festival, she managed to learn and memorize two Bach short preludes in a little over a month, just after her Certificate of Merit Level 3 test (for which she received Branch Honors), and I am so proud that she was selected as one of the winners! I would also like to congratulate her parents for making the wonderful investment of buying a new Mason and Hamlin grand piano for the children. I am sure you will all enjoy lots of beautiful music coming from this beautiful instrument in the years to come.